I went cross-country skiing in a Finnish forest last weekend. There still is quite a bit of snow in northern corners of Nordic Countries, however even in forests and at slopes of most northern spots one can enjoy well above-zero-degrees during sunny days this time of the year - like in the Alpine resorts. anyways a few layers lighter - like my Mum who I finally managed to capture in her tufted Heli vest that she absolutely fell in love with and wanted to get one made for her too, when she saw me making the first one of this design for my customer a couple of years ago. 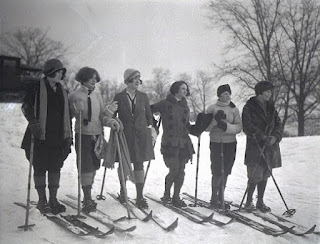 - or these girls in 1925! Like in all sports fashion plays very important part in skiing too and depending on the temperature and the location of the slope, people watching is great form of entertainment. 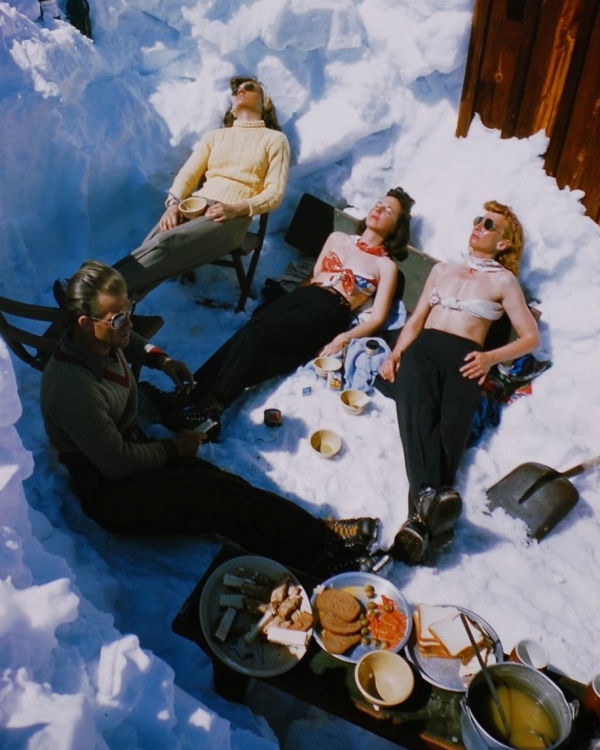 Everyone knows, how fast time flies when sitting at the terrace of an Alpine hillside cafe - or a cafe in the heart of Paris, sipping a coffee sharpened with a drop of something warming and watching all sorts of creations racing by. 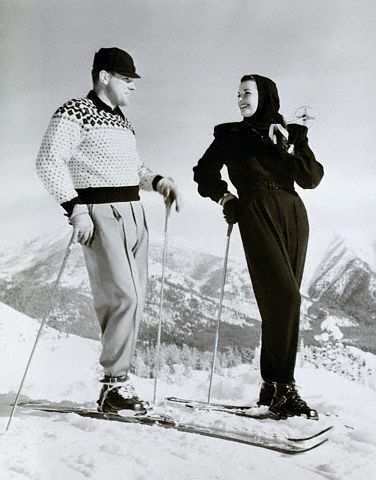 Most skiers seem to invest in latest technical inventions in their clothing rather than to anything too fabulous fashion wise. I agree functionality of garments is the key word when one wants to get the best out of any form of skiing fitness wise. However Sunday-skiing is completely different thing and as 'vintage' is today's big word I'd wish to see more of those chic/funky old styles on skis at the forest and lake tracks and open-to-all parts of slalom slopes too, not just in the heart of the cities. 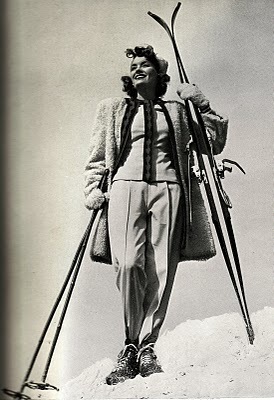 Jane Russel in her winter 1948 outfit - very chic! 60's - absolute favourite of mine! 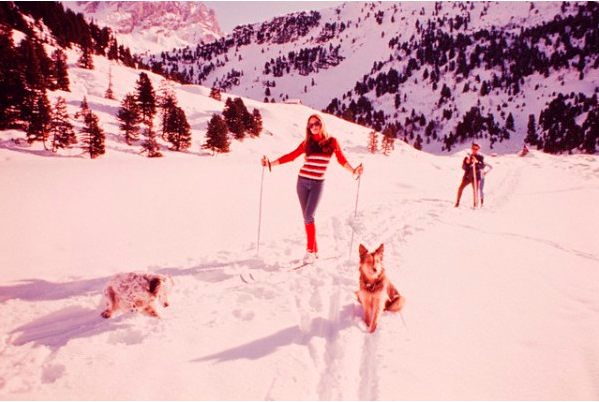 Inspired by BB wearing jeans on skis in 70's I tested it myself on my Easter skiing trip and I can warmly recommend the denim skiing pants - as long as you don't fall! 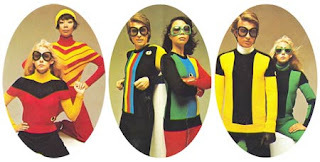 - How fab are these guys! I love this lady in her non-functional prim hat and shoulder bag - one race down-hill and I bet they went missing! However she looks super chic. I rather close my eyes when 80's and 90's skiing fashions are approaching my sight, however this girl's onesie and accessories are styled with kind of a good taste and her attitude is such a perfect match with her outfit that I just had to add her picture to my skiing fashion wish list. - Now, what's your favourite skiing outfit like? Fab photos. I love fashion history. Very intersting post Heli.